very pretty image! soon there will be snow to blanket those limbs! I couldn't be more smitten with your phenomenal photos! Outstanding! We've had terrible winds here too -- up to 50 mph and they've stripped our ash tree of its beautiful yellow leaves. We do have a wonderful carpet of yellow on the ground. Your image represents this so perfectly! love the design of the bare branches! Superb capture and I love your composition, Reena! Perfect words! It is that time of year!! Hope you have a wonderful weekend! love, love, love... photo and words. Awww! Very sweet, and depictive, and beautiful! I just love those stark black branches - simply lovely processing too! Great words and a fantastic photo! they do look very close to being bare. I like them green and providing shade. Beautiful poetry ...again...Reena! That last line touches my heart. Of course the image is wonderful, too. Such a beautiful sky with the trees etched in black. Ohhh that is so beautiful. Your photo and words. What a beautiful photo...Makes me sad to see the leaves all gone. I guess I wasn't quite ready to see fall go. HI renna...this is a great photo and great words to match ..love it!! Hello Reena seize you know the right time. A pretty picture, so well done. Superb. Lovely image, Reena! Well done! I hope you have a great weekend! This is so pretty! 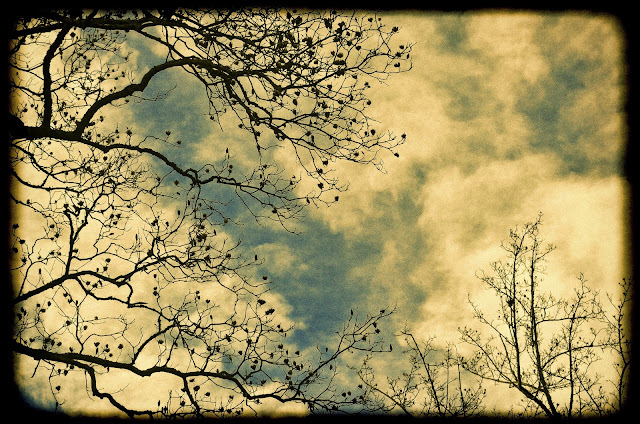 I love the branches against the beautiful sky. You always make me see the world in a different way, not only because of the photos, but the little poems you write to go with it. Thanks Reena. You did not even have to name it November. The picture just screams it. Awesome!!!!! beautiful photo. I love bare trees. once a blogger said in email to me, she was feeling down, there was nothing out her window but snow and bare trees and I said I LOVE bare trees, grab a few shots for me. Oh I like that effect, I was playing with too ..
Another beautiful picture accompanied by rich Reena words. Reena! Such a beautiful capture!!! No-vember = No-fun. Nice photo though. Beautiful - all of it. Both your words..and image! I like the words, a lot, but LOVE the photo. Terrific! gorges, I love everything about this shot and the work you did. This is wonderful. I love the Vintage feel it has. This is beautiful Reena - both the photo and words. even without the leaves the trees are beautiful. Love that shot. wow that is a really beautiful shot--I really love the processing on it! Gorgeous photo. I love colors so much! What a beautiful pairing of text and image. Love the processing. The border really makes the image pop. Thank you for sharing with Photo Art Friday, Reena.